A recent market study published by the company– “Antiseptic Bathing Market: Global Industry Analysis 2013 – 2017 and Forecast 2018 – 2026” consists a comprehensive assessment of the most important market dynamics. On conducting a thorough research on the historic as well as current growth parameters of the Antiseptic Bathing market, growth prospects of the market are obtained with maximum precision. The report features unique and salient factors that may make a huge impact on the development of the Antiseptic Bathing market during the forecast period. It can help market players to modify their manufacturing and marketing strategies to envisage maximum growth in the Antiseptic Bathing market in the upcoming years. The report provides detailed information about the current and future growth prospects of the Antiseptic Bathing market in the most comprehensive way for the better understanding of readers. The report commences with the executive summary of the Antiseptic Bathing market report, which includes the summary of key findings and key statistics of the market. It also includes the market value (US$ million) estimates of the leading segments of the Antiseptic Bathing market. Readers can find detailed taxonomy and the definition of the Antiseptic Bathing market in this chapter, which helps readers to understand the basic information about the Antiseptic Bathing market dynamics, cost structure, pricing analysis, Regional adoption by region, list of key market participants included in the report. This chapter includes detailed analysis of the growth of the North America Antiseptic Bathing market along with the country-wise assessment including the U.S. and Canada. Readers can also find regional trends, regulations, and market growth based on product type, end user and country of Antiseptic Bathing in the North American region. Readers can find detailed information about factors such as, pricing analysis, and regional trends that are impacting the growth of the Latin America Antiseptic Bathing market. This chapter also includes the growth prospects of the Antiseptic Bathing market in leading LATAM countries such as Brazil, Mexico, and rest of the Latin America region. Important growth prospects of the Antiseptic Bathing market based on its product types, and end user in several European countries, such as U.K., Germany, Francce, Italy, Spain, Russia, and Rest of Europe is included in this chapter. Japan, India, ASEAN-5, Australia, South Korea are the leading countries in the APEC region that are the prime subject of assessment to obtain growth prospects of the APEC Antiseptic Bathing market in this chapter. Readers can find thorough information about the growth parameters of the APEC Antiseptic Bathing market during the period 2013-2026. Readers can find important factors that can make a huge impact on the growth of the Antiseptic Bathing market in Japan based on the market segmentation, during the forecast period. This chapter provides the overview of regulations, drivers, restraints, and trends in the China Antiseptic Bathing market. This chapter provides information on how the Antiseptic Bathing market will grow in the major countries in MEA region, such as GCC Countries, and South Africa, during the period 2013-2026. In this chapter, readers can find a comprehensive list of all the leading stakeholders in the Antiseptic Bathing market along with detailed information about each company, including company overview, revenue shares, strategic overview, and recent company developments. Market players featured in the report include Ecolab Inc., 3M Co, Reyanard Health Supplies, Becton, Dickinson & company, Clorox Company, Air Liquide (Schulke Australia Pyt. Ltd.), Molnlycke Health Care AB, Medline Industries, Stryker Corporation, HiCare Helath, among others. Based on the product type, the Antiseptic Bathing market is segmented into CHG Bath Towels/Wipes, CHG Solution, Antiseptic Wipes, Antiseptic Bathing Solution, and Antiseptic Shampoo Caps. In this chapter, readers can find information about key trends and developments in the Antiseptic Bathing market and market attractive analysis based on the product type. In this chapter, readers can find information about key trends and developments in the Antiseptic Bathing market and market attractive analysis based on the product type for each region. Based on the End User, the Antiseptic Bathing market is segmented into ICU, Surgical Wards and Medical Wards. In this chapter, readers can find information about key trends and developments in the Antiseptic Bathing market and market attractive analysis based on End User. In this chapter, readers can find information about key trends and developments in the Antiseptic Bathing market and market attractive analysis based on the End User for each region. This chapter explains how the Antiseptic Bathing market will grow across various geographic regions, such as North America, Latin America, Europe, Asia-Pacific Excluding China (APEC), China and the Middle East & Africa (MEA). This chapter helps readers to understand the research methodology followed to obtain various conclusions, important qualitative information, and quantitative information about the Antiseptic Bathing market. In developed nations, pre-operative bathing is already recommended by most of the organizations. However, there is a change in recommendation seen in these regions. For instance, in 2014, the Center for Disease Control and Prevention issued a draft for their intended updates to their recommendations for preoperative patient skin cleansing and for the prevention of SSI. The updated recommendation now no longer specifically recommend the use of an antiseptic, but allow for cleansing with either an antiseptic or soap and water. Similarly, the Association for Per-Operative Registered Nurses (AORN) has also changed its recommendation of two times cleansing with CHG to one time cleansing with soap or an antiseptic. The scenario is slightly different in the APAC region where the organizations are focused on imposing pre-operative bathing recommendations unlike the developed countries that are in debate whether CHG is a better substance for pre-operative bathing. Many organizations strongly recommend at least one shower (antiseptic/non-antiseptic) prior to the surgery. Any drastic changes in the regulations/recommendations may hinder the market growth during the forecast period. Surgical-site infections (SSIs) account for over US$ 3.0 billion in healthcare costs per year, with more than 150,000 new cases occurring annually in the U.S. A large portion of this cost is attributed to lengthy hospital stay, readmissions, and recurrent surgeries for infected patients. The same is true across the world. According to the WHO, health care-associated infections are more frequent in resource-limited settings than in developed countries. The WHO estimates that, the healthcare associated infection prevalence varies from 5.7% to 19.1% among lower-middle income countries. The concerns with rising number of surgical site infections is driving authorities to increase awareness and take actions towards reducing the number of surgical site infections. One such action is the recommendation for the use of antiseptic bathing products for pre-operative cleansing of skin. A number of factors pose as an opportunity for the expansion of the antiseptic bathing market. For an instance, growing number of surgeries and focus on to prevent surgical site infection along with increasing adoption in the emerging regions prove to drive the market growth significantly. Also, a large number of local players are slowly emerging in the APAC region. Integration with these players could help create strong foothold in the APAC region for antiseptic bathing product manufacturers. Globally, the ageing population is growing. Every country in the world is experiencing growth in the proportion of ageing population. For instance, according to the World Bank, the percentage of people older than 65 years has increased from 9.7% in 2015 to 10.1% in 2016 in China. Similarly, in the US, percentage of people older than 65 years increased from 14.6% to 15.0% from 2015 to 2016. There are a number of disease associated with old age that include Cardiovascular disease, Osteoporosis, Chronic Obstructive Pulmonary Disease, Dementia, Cancer, Diabetes and many others. This will in turn lead to increased hospitalization and further boost the growth of the antiseptic bathing market. A number of organizations including the Asia Pacific Society of Infection Control have poor recommendation for use of antiseptic bathing products including the WHO. WHO states, it is a good clinical practice for patients to bath or shower prior to surgery. However, the panel suggests that either plain or antimicrobial soap may be used for the purpose. The panel has decided not to formulate a recommendation for the use of CHG wipes for the purpose of reducing surgical-site infection due to low quality of evidence. Similarly, the Asia Pacific Society of Infection Control assessed that studies with the use of 4% CHG showers and 2% CHG impregnated cloths in combination with CHG bathing for sustainable decrease in skin bacterial decolonization, which also failed to demonstrate the decrease in SSIs. Thereby the organization concluded that the current evidence suggests that there is no significant difference between plain bathing and antiseptic bathing. The lack of evidence has hindered the recommendation for use of antiseptic bathing by a number of organizations, which is expected to hinder the growth of the market significantly. For more such actionable insights on the potential of the Antiseptic Bathing market, request a sample copy. Competition section of the Antiseptic Bathing market features profiles of key players operating in the industry based on their differential strategies, product offerings, marketing approach and company dashboard. Some of the key players featured in the antiseptic bathing market include Ecolab Inc., Reyanard Health Supplies, Becton, Dickinson & company, 3M Co, Clorox Company, Air Liquide (Schulke Australia Pyt. Ltd.), Medline Industries, Molnlycke Health Care AB, Stryker Corporation, HiCare Health, among others. The antiseptic bathing market is a fragmented market due to the presence of a number of local players throughout the world especially in the APAC region. The key manufacturers of Antiseptic Bathing are focusing on expanding in the emerging countries. Most companies are doing so through acquisition of local companies in the region. Furthermore the presence of local companies is increasing the completion as well as rising the pricing pressure in the APAC region. Antiseptic bathing is recommended prior to a surgery. Most of the regions worldwide recommend two times bathing with antiseptic products prior to surgery. Antiseptic bathing products are also used in ICUs and medical wards, where the patient is confined to the bed for a long duration. Such patients are provided with a bed bath using antiseptic solution or wipes. The practice of antiseptic bathing in ICU is more stringently followed than other wards. The company conducted a research study on Antiseptic Bathing market for the forecast period 2018 to 2026. The Antiseptic Bathing market report offers a comprehensive evaluation of the business opportunities prevailing in the Antiseptic Bathing market along with insights on the Antiseptic Bathing tests consumption trend, disease incidences, and awareness level for Antiseptic Bathing and Antiseptic Bathing market competition. The report elaborates on the macroeconomic factors influencing the dynamics of Antiseptic Bathing market and its futuristic potential. The report offers a comprehensive taxonomy of Antiseptic Bathing market based on product type, end user, and region. The Antiseptic Bathing products are available in different form including CHG towels/wipes, CHG solutions, Antiseptic bathing wipes, Antiseptic bathing solutions and Antiseptic shower caps. 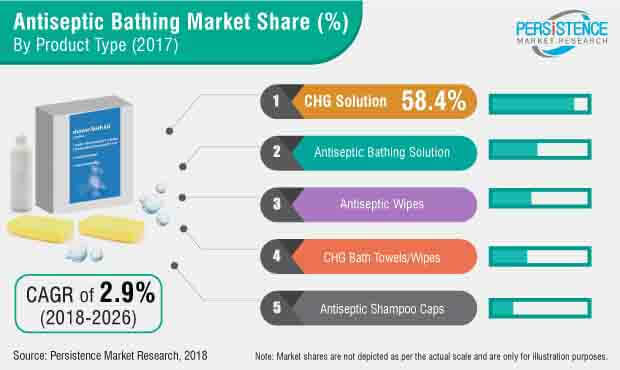 End-use segments in Antiseptic Bathing market which are a part of this Antiseptic Bathing market report include ICU, Surgical Wards and Medical Wards. The Antiseptic Bathing market has been analyzed across regions of North America, Latin America, Europe, Asia Pacific Excluding China, China and MEA. What is the revenue potential of point of care Antiseptic Bathing across regions of North America and Europe? Who are the key competitors and what are their portfolios in Antiseptic Bathing market? What are major challenges influencing the growth of Antiseptic Bathing market? How intervention from regulatory authority is shaping the Antiseptic Bathing market growth? For answers of all the possible questions required for gauging the performance of the Antiseptic Bathing market, get in touch with our expert analysts. The Antiseptic Bathing market has been estimated based on supply-demand approach. The market was first calculated based on hospital bed volume conducted in different region/countries and its occupancy. The hospital bed volume was estimated based on the number of hospitals in top 20 countries globally. Other qualitative factors analyzed during test volume estimation include awareness level for Antiseptic Bathing, number of surgeries and others. This information is further validated with rigorous primary research (including interviews, surveys, in-person interactions, and viewpoints of seasoned analysts) and secondary research (including verified paid sources, authentic trade journals, and resourceful databases). The research study on Antiseptic Bathing market also includes top trends and macro as well as micro economic factors shaping the Antiseptic Bathing market. With this approach, the report on Antiseptic Bathing market anticipates the industry attractiveness of every major segment in Antiseptic Bathing over the forecast period.